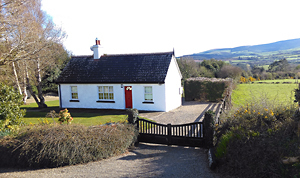 A most attractive detached cottage on an acre of enclosed lawned gardens, in a beautiful hillside location with mountain views, in one of the most scenic areas of County Wicklow, which is known as 'The Garden of Ireland'. 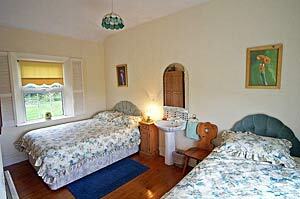 Most tastefully decorated in Spanish style... with an abundance of colourful furniture and ornaments. One bedroom with double and single beds. Bathroom with bath and shower. 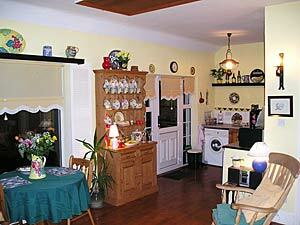 Kitchen / living room with open fire, wooden floor, original pine dresser, with washing machine and microwave. Large patio area and spacious gardens front and rear. 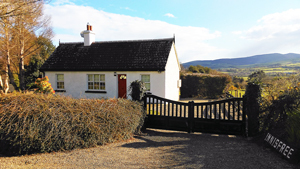 This individual cottage is only 3 minutes drive from the noted 'Woodenbridge Hotel' which is the oldest hotel in Ireland - est. 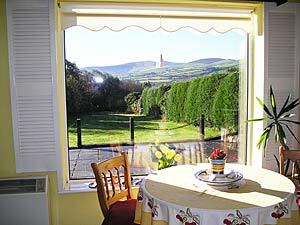 in 1608 and overlooks the amazing Woodenbridge golf club in the Vale of Avoca. 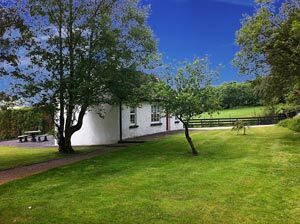 Avoca Village (less than 3 kms away) is where the BBC TV Series ‘Ballykissangel’ was filmed and it’s also the home of 'Avoca Handweavers'. It includes a Craft and Gift Shop, Visitor Centre, Café and tours of their Weaving Mill which dates back to the year 1723. Well worth a visit! The village also has Fitzgerald’s Pub, Henley’s Grocers and a Pharmacy. Local Attractions include Glendalough (valley of two lakes), founded by St. Kevin in the 6th century, boasting fascinating monastic history and stunning scenery), Meeting of the Waters (it was here in 1808 that the poet Thomas Moore composed the famous Irish melody 'The Meeting of the Waters'), Avondale House And Forest Park (former home of Charles Stewart Parnell), Glenmalure Valley and Waterfall, Wicklow Historic Gaol, Powerscourt House & Gardens. 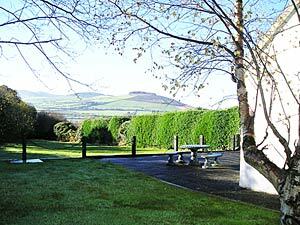 Beaches are located at Arklow (9 km), Clogha (12 km), Ballymoney (14 km), Courtown (17 km) and just 19 kms away is the beautiful beach of Brittas Bay, with the renowned 'European Golf Club' running alongside. 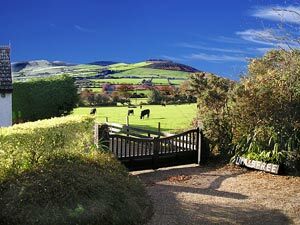 Dublin is only 64 km and easily accessible by train from local station.